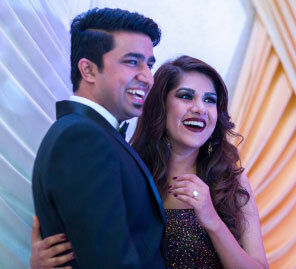 Sanya and Shalabh’s wedding at the Courtyard by Marriott Agra was a fairytale come true. From a vintage-themed cocktail party to a brightly decorated mehndi and a traditional wedding ceremony, the Courtyard by Marriott hotel in Agra organized and provided the perfect setting to celebrate Sanya and Shalabh’s beautiful union. With all the main functions planned for Agra, the cocktail night was the only celebration planned in Shalabh’s hometown, Meerut. A hotel owner, Shalabh is passionate about décor and for his own cocktail party, decided to do a lot of research. Finally, he settled on an ‘all red’ color scheme with a touch of vintage. Red drapes florals and candlelight gave the venue an old world charm. With the glitzy décor as the backdrop, Sanya looked stunning in a Falguni and Shane Peacock gown while Shalabh looked dapper in a sharp tux from Study by Janak. The mehndi event was planned for the morning of the wedding, at the Courtyard by Marriott Agra. Shalabh and Sanya both wanted to celebrate in the lush surroundings of Anise, the open-air resto-bar at the Marriott. The venue was festooned entirely in genda-phool, perfectly complementing Shalabh’s Rohit Suri kurta pajama and Sanya’s vintage gold dress by Study by Janak. An ode to their strong friendship and inevitable romance, the wedding was held on the sprawling lawns of the Courtyard at the Marriott Agra. Chosen for its proximity and hospitality, the venue was awash in red, white and pink florals to the delight of guests. 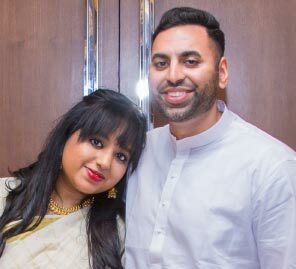 Shalabh wore an all white sherwani with a golden safa from designer Gaurav Vaswani while Sanya was resplendent in a dark green and pink embellished lehenga from Study by Janak, having accessorized with an assortment of Kundan and polka jewellery.